Sometimes the flavors in a bar are right up front, other times they are more mysterious. Perhaps during those mysterious times I'm a bit distracted, not paying attention, I've lost focus. Yes, life is like that sometimes. Try focusing intently on what you are tasting. You may have to taste the same bar over and over. Slow down, relax, focus, taste. In that order. The first taste of this bar told me there was fruit and deep chocolate notes. Actually describing it was another matter. I couldn't find the words to translate the flavors. 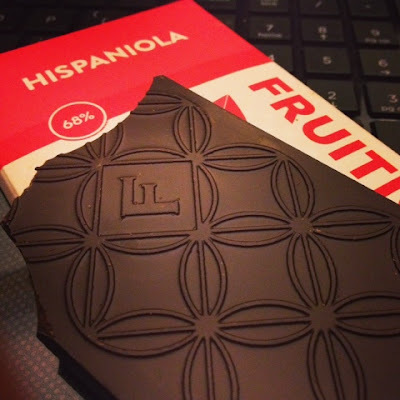 The words for the notes I found in the Fruition Hispaniola bar finally came after a week of tasting. Notes of deeply roasted peach. Intense chocolate flavors touched with a hint of raspberry. Smooth, rich melt and long finish. 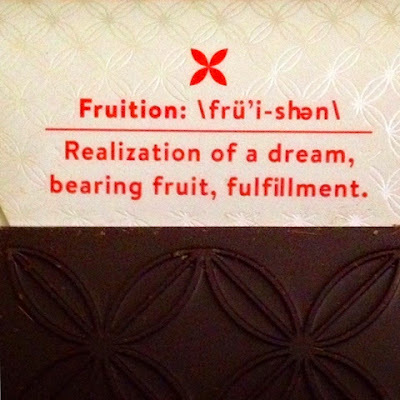 Fruition Chocolate Realization of a dream, bearing fruit, fulfillment.